Learn Formulas, Approaches, Techniques And Specific Questioning Procedures For: Uncovering The Truth- Convince People To Confide In You- Know What People Really Think- And Discover The Truth From Anyone, Anywhere And Any Time You Need To! Containing New And Innovative Results Producing Interviewing Methods That Show You How To Develop The Information You Need To Develop - Even From Unwilling Witnesses & Subjects! 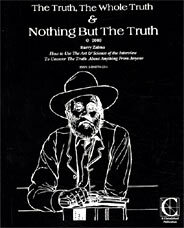 Recent studies still show that: Of every type of skill and technique you must develop to become successful as an investigator, interviewing skills is likely the most important and this book hands you the world's best methods, approaches, procedures, forumulas, techniques and specific questioning methods to uncover the truth from people. You'll be amazed and delighted with this work on investigative interviewing by top-flight attorney, claims specialist and investigator Barry Zalma. Mr. Zalma hands you his extremely successful knowledge of investigative interviewing based on his thirty plus years of doing it every day. It took a long time to master the knowledge base, approaches, formulas, techniques and specific questioning procedures Mr. Zalma uses and uses very successfully because he learned them one step at a time through over thirty years of trial and error. Perhaps no other man on earth has developed and fine-tuned the art and science of investigative interviewing like Mr. Zalma has and now these power investigative interviewing techniques can be all yours. Today, we have a huge selection of methods and tools to choose from to collect information but it's still the investigative interview that produces the overwhelming majority of hard-core facts in the investigative process. This is your road map to do just that! Power Techniques, Formulas And Procedures For The Informal Investigative Interview. The Art Of Investigative Interviewing And How You Can Develop It. The Science Of Investigative Interviewing And How You Can Use It. Developing Your Listening Skills-One Of The Most Important Skills And How You Can Use It. Innovative Interviewing And Interrogation Methology For Your Use. Hardboiled Salesmanship Principles For The Professional Investigative Interviewer. Why No One Can Lie To A Successful Interviewer/Interrogator Consistently And How You Can Use This Secret To Your Advantage. Preparation For The Interview Geared Towards Your Results. Best Methods Of Starting The Interview. How You Can Develop And Keep Control Of The Interview. Bluffs And The Hows And Whys Of Success Using Them. How, Why And When To Offer No Comfort In An Interview To Get What You Came For. How You Can Deal Very Successfully With Difficult Witnesses And Get What You Want. How You Can Deal Successfully With The Nervous Witness. How To Successfully End An Interview For Your Own Benefit. How To Come Back For A Second Interview And Get More Of What You Want.